Utah’s city lights are baffling — and killing — migratory birds. Conservationists say it's time to go dark. 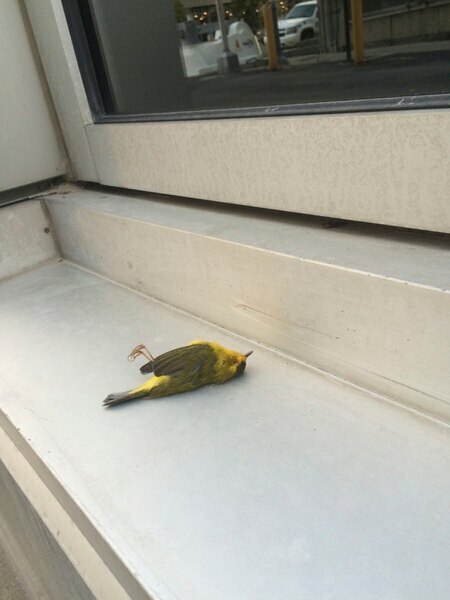 (Courtesy Tracy Aviary) A Wilson's Warbler lies dead in a doorframe in Salt Lake City. It is one of 44 fallen birds that researchers collected last year to learn more about Salt Lake City's hazards to migrating birds. Tracy Aviary and SLC Dark Sky are asking building owners to turn off their lights during the spring and fall months to prevent nighttime flyers from being drawn into the city, where many become disoriented and crash. 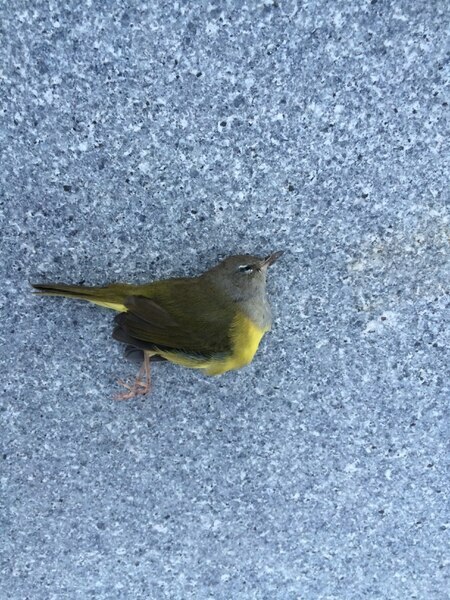 (Courtesy Tracy Aviary) A MacGillivray's Warbler lies dead on pavement in Salt Lake City. It is one of 44 fallen birds that researchers collected last year to learn more about Salt Lake City's hazards to migrating birds. Tracy Aviary and SLC Dark Sky are asking building owners to turn off their lights during the spring and fall months to prevent nighttime flyers from being drawn into the city, where many become disoriented and crash. (Courtesy Tracy Aviary) A White-Crowned Sparrow lies dead on pavement in Salt Lake City. It is one of 44 fallen birds that researchers collected last year to learn more about Salt Lake City's hazards to migrating birds. Tracy Aviary and SLC Dark Sky are asking building owners to turn off their lights during the spring and fall months to prevent nighttime flyers from being drawn into the city, where many become disoriented and crash. When a bird flies into Salt Lake City at night, it is bombarded with confusing waypoints: lighted windows in tall buildings, digital billboards, electric signs and floodlit façades. “They get drawn in because they’ve evolved to use sources of light to help them navigate, using where the stars and moon are to orient them,” said Cooper Farr, conservation scientist at Tracy Aviary. City lights are baffling bird brains, luring them toward buildings, where many of them crash, Farr said. In a brief study last year, volunteers found 44 dead migratory birds in downtown Salt Lake City — and that is almost certainly a tiny percentage of the birds that died. To help protect the winged travelers, Tracy Aviary is asking businesses and residents in Utah to switch off their lights from 11 p.m. to 6 a.m. during spring and fall migration months, adding Salt Lake City to a national “Lights Out” movement organized by bird conservationists. Dark Sky SLC and Tracy Aviary are launching the Lights Out campaign at a sold-out event Thursday at Liberty Park. Advocates are reaching out to building owners, starting with those in last year’s 21-block study downtown. Volunteers roamed the streets and sidewalks in search of dead birds at least three times in spring (March through May) and three times in fall (August through September). They found 19 species among the fallen, mostly songbirds like tanagers and warblers but also some larger birds and waterfowl, such as coot, said Jess Dwyer, founder of the nonprofit Dark Sky SLC, which promotes reduction of light pollution. Scientists at Tracy Aviary and the University of Utah are reviewing their findings as the study’s second year begins next month, trying to identify building characteristics that correlate with more fatal crashes. Researchers wouldn’t disclose specific buildings that appeared to pose special crash hazards, but preliminary data confirmed what scientists in other cities have found. “The major culprits are downtown buildings with a lot of internal lighting,” Dwyer said. About two-thirds of migratory birds travel at night, when temperatures are lower and winds tend to be calmer, Dwyer said. Especially on cloudy nights, city lights draw the birds lower. In the city, the birds become disoriented and susceptible to crashes at night; their brains don’t associate electric light with buildings, so “visibility” doesn’t help them. Then, when the sun rises, they may find themselves trapped in a maze of buildings with reflective surfaces that also pose a crash risk. (Courtesy Tracy Aviary) A White-Crowned Sparrow lies dead on pavement in Salt Lake City. Anywhere from 100 million to 1 billion migrating birds die in building crashes in North America each year, according to FLAP (Fatal Light Awareness Program) Canada, which spearheaded the urban bird safety movement about 25 years ago. Nighttime lighting is relatively low-hanging fruit for bird safety advocates. It’s easier to change than a building’s structural elements, and it matters more. Researchers in Toronto found that the amount of light coming from a building influenced bird deaths more than even the building’s height. In Chicago, bird researchers at the Field Museum for decades have collected thousands of fallen specimens around the massive McCormick Place convention center; since the center joined the “Lights Out” movement about 20 years ago, annual bird deaths dropped by more than two-thirds. With lighting often associated with public safety, property owners are sometimes reluctant to dim down, Farr said. Blinds can help keep essential lighting — as in stairwells — from glowing into the night, she said. Bulb shields can keep exterior lighting aimed toward the ground rather than radiating into birds’ view. The aviary also is welcoming committed volunteers to search designated city blocks for dead birds and help collect data. Prospective citizen scientists should email Farr at cooperf@tracyaviary.org. Anyone can join the “Lights Out” movement to protect migratory birds. Here are some tips from Cooper Farr, conservation scientist at Tracy Aviary. • Turn off nonessential lighting indoors and outdoors — porch lights, path lights, vanity lights — from 11 p.m. to 6 a.m. during migration seasons: March through May and August through October. • Shut window blinds when indoor lights are on at night. • Aim exterior lights toward the ground and use bulb shields. • Use warmer-colored bulbs, which are less attractive to birds; 3,000 Kelvins or less is best. • Use motion sensors to activate security lights rather than running them continuously. Tracy Aviary also is welcoming committed volunteers to search certain city blocks for dead birds and collect data. Prospective citizen scientists should email Farr at cooperf@tracyaviary.org.